clamming was soooooo fun! Even though we FROZE! I can't wait to go out again. Clamming sounds like such a blast! Way to play up the pregnancy card--you have to do it now because as soon as that baby comes out, very little sympathy is passed your way. Then it's more like pity that you aren't getting any sleep. So cool that Sam felt the baby move! I love Baby N! and everytime you talk about clamming I always think of the episode from Dirty Jobs where they search for the gooey ducks! It's awesome. High fives all around for baby moving! 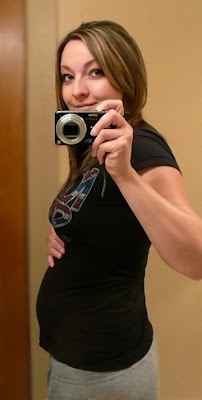 You are such a cute little pregger girly! Clamming? Can't say I've ever been! Looks fun though. Man, its been way too long since we've seen you guys! Don't you just love it when your baby moves? So amazing. Sometimes I look at Ryan and have to remind myself that he was that little baby moving not so long ago. Time is going to fly by and you're little one will be 3 years old like mine before you know it! Craziness! Lookin' good Aims! 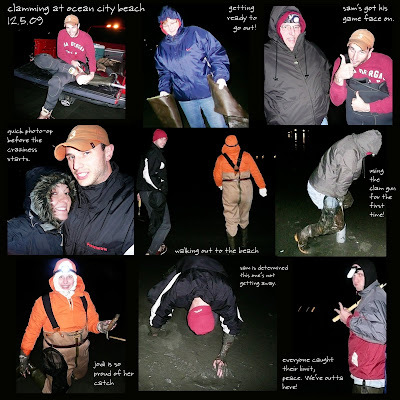 I LOVE the clamming photos... I NEED to DO THAT!! It looks like a BLAST... GREAT PICTURES TOO!! I LOVE the BABY BELLY!! Its CUTE!!!! Prayers for your PAPA!! Glad he is doing well:) Can't wait to see you guys SOOOO SOON!! So happy you have so much fun stuff goin' on! Your little one will only enrich your lives beyond belief! Dad continues to improve - each day is a little better... Love you! i love that everytime devin signs under carl's name she says its devin. as if we all don't know. silly girl. anywho, still totally excited for you down here. don't worry, you're not alone with creating a night owl. all babies love to wake up as you lay down becaue you've been lulling them to sleep all day with all that walking and working out you do. hence, as soon as they hatch they like to keep waking up night...love those 3 hour stretches in the middle of the night! woo hoo! you will love it. you'll love it all. okay, now that i've written a novel...have a great christmas! 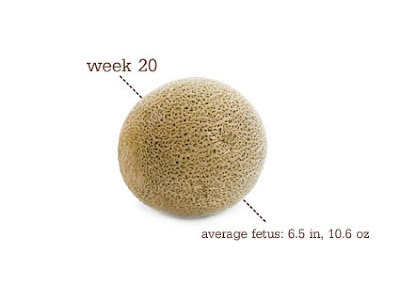 It is so funny - I think the same thing the farther along I get, the more I look back at 15 and 20 weeks and laugh because I thought I was just so big then - people still tell me I am so small but I am huge for me! I love your updates, its fun to see someone else as excited for their first. The clamming doesn't look too fun to me, cold! Anyway, you're looking way better than I ever did so be happy you got the good preggo genes! Love and miss ya - wish you were coming for Christmas! We will miss you!